Fantasy Football Wide Receiver Start/Sit Rankings (Week 11) - Fantasy Football, Fantasy Football Rankings | Mac Bros.
* Any additional updates that are necessary will be posted no later than Saturday in the final week 11 rankings (2009). 1. 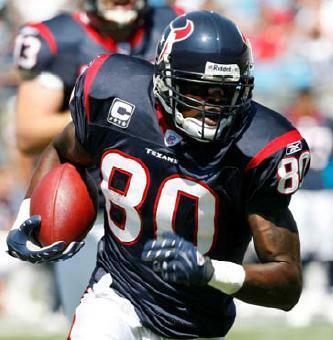 Andre Johnson (HOU) – No one loves a match up against the Titans more than Andre Johnson. In his last 2 games against Tennessee (1 last season and 1 this season), Johnson has accumulated 21 receptions for 356 yards and 3 TDs. While Tennessee has shown significant improvement in their pass coverage over the last few weeks, you still have to love Johnson’s chances against this secondary. He has a ridiculous track record of success against them and the Titans are still extremely vulnerable against a super elite receiver such as Johnson. He is a no brainer for week 11 fantasy line ups. 2. Larry Fitzgerald (ARI) – You have one of the NFL’s best fantasy receivers facing one of the more generous pass defenses in the NFL. There really isn’t much to say here other than you would be certified crazy to not have Fitzgerald penciled into your week 11 fantasy line up against the Rams. 3. Reggie Wayne (IND) – He is in the midst of a stellar 2009 fantasy campaign and he is also coming off of his best fantasy effort of the season against a top flight Patriots pass defense in week 10. That being said, how can you not like his chances against a mediocre Ravens secondary in week 11? 4. Marques Colston (NO) – Even the great Nostradamus himself could not have predicted such a miserable fantasy performance for Colston against a weak Rams secondary in week 10. Considering Colston had the flu and did not even start the game, you might want to give him a pass on that one as a healthy Marques should make up for it in week 11 against lowly Tampa Bay. The Bucs have allowed 19 passing TDs through the air in just 9 games and they give up the 3rd most fantasy points to WRs in the NFL. He should rebound nicely against this very fantasy friendly secondary. 5. Sidney Rice (MIN) – Not that you can complain, but how exactly does a player rack up 201 yards on 7 receptions and not find the end zone? We will just chalk it up as one of those rare fantasy football mysteries. As for week 11, the conditions should be favorable for Rice to make his way into that elusive end zone on top of having a nice yardage day. The Seahawks rank just 22nd in the NFL in pass defense, they have allowed 14 TDs through the air in just 9 games and they could be without both starting CBs this week due to concussions. You could be in store for yet another installment of the Favre to Rice air show in the Metrodome on Sunday. Who needs the Blue Angels when you can watch that instead? 6. Wes Welker (NE) – With the Jets lock down CB Darrelle Revis paired up against Randy Moss, you can probably expect to treat yourself to an extra helping of Brady to Welker this week. The Jets pass defense is solid across the board, so this match up may not be a cakewalk for Welker either, but as you know, the little man eats tough match ups for breakfast and poops them out in the form of double digit fantasy points every time. He is a must start in week 11, especially in PPR formats. 8. Vincent Jackson (SD) – It wouldn’t have been a terrible shock if the Eagles had simply limited Jackson to a mediocre performance in week 10, but 1 catch for 10 yards is almost unfathomable for the big play receiver. While there should be greener pastures ahead in week 11, it doesn’t get much easier for Jackson as he will square off against Champ Bailey and Denver’s 5th ranked pass defense. Jackson was able to find pay dirt against the Broncos in their week 6 meeting, but he was held in check for the most part otherwise, hauling in just 4 passes for 46 yards. This is not a fail safe match up for him, but he is very capable of putting up big numbers against anyone with his home run playmaking ability and he is certainly due to rebound after last week’s debacle. 10. DeSean Jackson (PHI) – As you know, Jackson is a hit or miss fantasy option and in all honesty, you would probably do just as well flipping a coin to decide when he will have a big performance and vice versa. There are certain match ups for him that are more favorable than others, but for the most part, you kind of have to stick him in your line up and hope for the best because Jackson is not a guy that you can afford to bench any week against any opponent. Fortunately, his week 11 match up is favorable against a Bears pass defense that has been fairly generous to opposing WRs so far this season. Chicago has given up the 10th most fantasy points to receivers in the NFL. 11. Anquan Boldin (ARI) – If last week was any indication, Boldin’s ankle is no longer an issue and he should get back to business as usual heading into fantasy football’s playoff run. Boldin has a great week 11 match up against a suspect Rams pass defense that ranks 26th in the NFL. He has a solid history against St. Louis and Boldin should make for a great fantasy option in week 11. 12. Randy Moss (NE) – He has been on fire of late, but Moss will have to deal with his arch nemesis in week 11 in the form of Jets shut down CB Darrelle Revis. Moss has struggled against Revis every time he has faced him and while Moss vows to get pay back this week, we have some doubt based on his track record. That said, Moss is more than capable of backing up his recent smack talk and an angry Moss is a very dangerous Moss as he will surely be giving it his all this week. If Confucius were alive, he would say to start Moss each and every week regardless of the match up. We are inclined to agree. 13. Steve Smith (NYG) – Plenty of targets and a soft match up against Atlanta’s 28th ranked pass defense should add up to a very solid fantasy effort for Smith in week 11. 14. Hines Ward (PIT) – After a very disappointing week 10 against Cincy, ward should get back on track with a very favorable week 11 match up against the Chiefs. Only 5 teams in the NFL give up more fantasy points to opposing WRs than Kansas City. 15. Steve Smith (CAR) – He is starting to heat up as Smith scored his third TD in 2 weeks in a Thursday night loss to the Dolphins. He also added 87 yards on 7 receptions. 16. Miles Austin (DAL) – You had to know the double teams were coming and they have. A week 11 match up against Washington’s top ranked pass defense will also be difficult to overcome, but the Skins have been vulnerable against the deep ball of late and we are optimistic that Austin will do some damage at home this week. 17. Mike Sims-Walker (JAC) – At first glance, a week 11 match up against one of the stingier pass defenses in the NFL is not all that favorable, but Sims-Walker has been money in home games all season and the Bills have several key injuries in the secondary this week. We like his chances. 18. T.J. Houshmandzadeh (SEA) – Consistency has been a serious issue for Housh so far in 2009, but he is coming off of his best game of the season and a match up against Minnesota is very favorable. The Vikings have been extremely generous against the pass in recent weeks and they will likely be without their best cover CB in Antoine Winfield for this match up. Housh could be in for a big week 11. 19. Chad Ochocinco (CIN) –He has been very quiet of late and a match up against Oakland’s lock down CB Nnamdi Asomugha won’t do him any favors, but Asomugha typically rotates his coverage amongst receivers. For this very reason, #1 receivers have been fairly successful against the Raid ers all season. There should be some opportunities for #85 to make some plays in week 11 and get back on track. 20. Donald Driver (GB) – He hasn’t been lighting it up of late, but you know Driver is going to be targeted often by Aaron Rodgers and a week 11 match up against a beat up 49 er pass defense that ranks 29th in the NFL bodes well. SUPPORT THE MAC BROS. START YOUR HOLIDAY SHOPPING BELOW.